So, 2015 online reviews: what changed and what stayed the same? Welcome to RevenueJump. Throughout 2016, we’ll provide news, stories, how-tos, case studies, resources, and even some shenanigans, all focused on online reviews, reputation management, customer service, and other areas of interest. Since reviews are at the heart of what we do, we thought we’d dedicate our first blog post to looking back at what happened in 2015. By all accounts, it was a landmark year for online reviews. Whether you own a business, work for an agency that handles reviews and reputation management, or are just worried about your eBay feedback, online reviews are a big part of your life. They might cause you anxiety. On the other hand, you might embrace them because you know how important they are to your success and profitability. If you don’t want to experience what Mario is experiencing there (and who would? ), I recommend you learn from 2015. Plenty of things changed, which we have no control over. I think we’re great at understanding and adapting to those changes, though. And our businesses’ reputations thank us for it. I’ll keep this part brief, but plenty of marketing agencies and other companies did extensive research on online reviews this year. They basically confirm what we already knew. If you want to spend your valuable reading time combing through dozens of reports and surveys, there are plenty. If you want to dig through some in-depth research and still have some time to watch The Goldbergs or play some Clash of Clans, I’ll give you a Reader’s Digest version of some of the better studies from this year. As we study online reviews more and interview more consumers, I think we’ll find those numbers skyrocket in the next few years. For me, the most noteworthy thing about online reviews in 2015 were the findings of my own research. In some ways, it feels like enlightenment, complete with a Zen garden and an old Enya CD. This year, I got more involved in reviews than I ever have before. I’ve been doing reputation management, and consulting my clients on how important their online reviews are, for years. But this year, I decided to dig deeper and find out just how important they are– with quantifiable numbers. Basically, I analyzed how reviews play into Google’s local search results. With the help of my 9 and 11 year olds (who did data entry, because it’s the modern, indoor equivalent of character-building, back-breaking manual labor), I analyzed 22,032 local listings. I spent countless hours poring over search results in my home office, which doubles as my laundry room. I’m now convinced the rhythmic whirring of my washer and dryer could put any EDM DJ out of business. The beat is infectious. Or I just spend too much time in my laundry room. Despite my new affinity for washer-and-dryer beats, I initially wanted to hire someone else to do the work because it seemed, well… boring. But the more I trudged through the trenches, the more enraptured I became. In the beginning, I thought review count had a direct effect on where a business listing might rank in Google’s local search results. In the end, I know review count plays a direct role in a local business’ rankings. You can look at all the research here. The full study reveals even more juicy tidbits. For me, this research was a game changer. I know how the sausage is made. And if you’re interested, all the 2015 online reviews data is right here at your fingertips. It also reinforced my belief that hard work pays off. And my sons are much stronger now, mentally, if not physically. Once you’ve input data for 20k+ local listings, you can do anything. Really, I gave them the greatest gift of all. They should be thanking me. 2015 was a big year for online reviews, but it was also a big year for fake online reviews. We’ve known about fake online reviews since we’ve known about online reviews. Faking a review is essentially just telling a lie that benefits you, harms a competitor, harms a business you don’t like, or does all of the above. Lying is as old as humanity itself, so it’s no wonder it’s a big component of online reviews. We all had our suspicions, but we didn’t know how bad it was until the UK’s Competition and Markets Authority dropped a truth bomb on us. A revised and updated Harvard study also found that between 15-30% of online reviews are fake. Additionally, the BBC reported on some nasty cases of fraud and blackmail. When the BBC sets its excellent journalists on a story, you know it’s important. They also reported independent businesses are more likely to leave harmful fake reviews for their competitors than enterprise or franchised businesses. Basically, you can pay someone between $1-$10 to leave a fake review that promotes your business or damages your competition. An Inbound.org community member experienced that just a few weeks ago. She worked hard to build up a trustworthy business and a great brand, and someone nearly shattered it by buying fake hundreds of obviously fake Facebook reviews. Luckily, Facebook finally came to its senses and her loyal customers and brand advocates did their best to come to her rescue. We plan to follow up on this story soon, so stay tuned. Needless to say, we’ll be touching on fake online reviews a lot in the coming year. Google reviews both changed and stayed the same this year. They still exist, and they’re still front and center in the SERPs, but there are a few little hang ups now for businesses. If you’re a new business, you might find yourself in a bit of a Catch 22 situation. It’s akin to needing work experience to land your first entry-level job. Essentially, your customers can’t leave you a review right from the SERPs unless you already have some reviews. Since Google all but killed Google+ for businesses, your customers have to leave a review from Google Maps… or you can provide them with a link to your Google Local Business Listing. It’s honestly kind of a labyrinth. As you can see, Meridian & Middleton Dental, in this example, doesn’t look nearly as good as the other options in the 3 pack… it doesn’t have those coveted gold stars. That’s because it has fewer reviews than Scott W. Grant and Legacy Smiles. 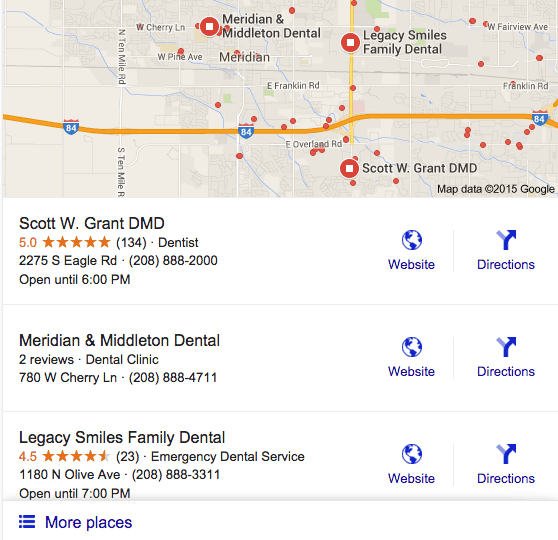 Those review stars are right in their potential patient’s local search results. Google reviews are more important than ever for all local businesses. And if you don’t have any reviews? You’ve got your work cut out for you. It’s been an interesting year for Yelp. They’ve taken a few hits this year in terms of share prices and overall website traffic, but they’ve also put a few measures in place to, *audible gasp*, help business owners. There will be ebbs and flows, but we’re going to be talking about Yelp for years to come. In 2015, shares of Yelp fell about 9% when Facebook started testing some more robust review-centered features. They’re not down for the count, but it showed they weren’t entirely invincible. Yelp also lost some serious web traffic after a few Google search algorithm updates. Google and Yelp might be on even worse terms than business owners and Yelp, which, as any business owner can tell you, is no small amount of vitriol. According to a Yelp sponsored study when local search is involved Google services its users with an inferior version of its search engine. Data scientists at Yelp are of the opinion that the most relevant and crucial information for users is not displayed straight off. They allege that Google manipulates local search results to give preference to Google products. … The main issue of Yelp’s complaint is that Google monopolizes the search engine space. The latter can potentially eliminate an entire industry by deliberately tweaking its search algorithms. In the future, Google and Yelp might become uneasy allies or even frenemies. But, for now, they’re butting heads like two hungry goats clashing over a freshly-spilled trash can. Contrary to popular belief, though, Yelp doesn’t hate business owners. Sure, they want your money– but they do care about protecting you, at least to some extent. So, Yelp will show your potential customers evidence of fraudulent reviews. This is a big win for any business whose success is tied to Yelp reviews, even to a small degree. Facebook reviews are valuable for business owners because so many people use Facebook as a standalone search engine. They can look up a business and check its reviews right from their own Facebook page or app– which is nearly always open. Facebook knows its reviews are valuable, and it’s trying to up the ante. Search Engine Land has learned about a new “Facebook Professional Services” area on Facebook, where the company appears to be taking direct aim at local search companies like Yelp and Google by offering listings of local businesses and services, complete with user reviews. It’s taking reviews into account, of course, but like all of Facebook, its results are deeply personalized for the user. When they search for pizza, a laundromat, a dentist, a contractor, or a record store, the reviews are right there. They don’t have to check individual pages to see the reviews. Google and Facebook, much like Google and Yelp, are not best friends. In 2015, Facebook saw some of its review rich snippets (explained here with screenshots) taken out of Google’s search results. For all their sometimes-creepy data mining and weird privacy policies, Facebook does want to help users find the local businesses that best fit their needs. Reviews are a big part of that. So, there you have some of the biggest stories in the world of online reviews this year. It’s also worth noting that Amazon is changing some of its review policies and people are campaigning against fake/paid-for reviews on TripAdvisor. We’ll explore all of these stories and more as time goes on. When it comes to online reviews, there’s no shortage of action. 2015 online reviews: a landmark year! We can’t wait to see what 2016 brings with it. Not bad for a first blog post, eh? Question: What are your predictions for online reviews in 2016? Tell us in the comments!